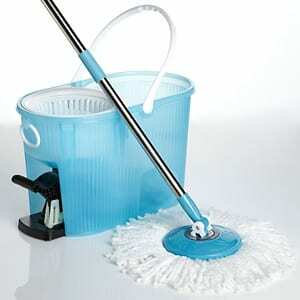 The Spin Mop provides a way to complete perhaps arguably the most difficult part of mopping, the wringing out of the mop. It does this using a spinning motion and centrifugal force so that you don’t have to do it with your hands. But how well does it really work? The concept itself is simple enough, you simply place the mop head into a spinning device, step on a pedal a few times and it spins around so that the water is whisked out of the mop and you’re ready to go again. When you compare this to using a regular mop you’re left having to compress a lever to try to squeeze out all of the water. Or maybe it’s a sponge mop and you end up folding it onto itself. Either way, it’s not as effective as whipping the water out of it, so the advantage is clear here. The makers of the Spin Mop claim that it helps you do your floors without having to touch the mop or get near its dirtiest parts. It’s a way of keeping a safe distance from anything gross, while still being able to wring it out so that you can keep mopping. This mop boasts an advantage over other spinning mops in that they’ve improved the design. You no longer have to use a foot pedal to get it to spin, you simply push down on the mop handle itself to get it to start spinning. Cleaning products often come with some hype baked right in. This is because we all want a clean home, and anything that helps us get it without expending a lot of time and energy is much appreciated. In this instance they are selling the benefit of not having to wring out a mop head, which is huge since this is most of the grunt work involved with mopping. The Spin Mop can be had for $40 and many online retailers, a price that is higher than most conventional mops, but that is to be expected since it is designed to outperform them. It’s also worth noting that there are several other mops on the market that are pricier than this one, and that have reviews that aren’t as positive. This should provide less commitment on your part if it functions as described because you’ll be able to complete your mopping tasks more quickly and easily. When you consider that you’ll finish mopping with more energy to spare, it’s really a quality of life improvement that we’re talking about here. The Spin Mop gets good reviews overall, which leads one to believe that a simple idea was followed through with a simple design and it flat out just works. A mop is the tool of choice when picking up any amount of liquid that has spilled on the floor because you don’t have to get down on your hands and knees, and you don’t have to stoop down or bend over to pick it up. You stay in a comfortable position, and the system here keeps you in that nice upright position even when wringing out the mop head. The moving parts here all seem to stand up to repeated use, according to users that have put it to the test in the real world. Also consider that the Spin Mop is good for random liquid spills like if someone spills a glass of milk or water. It’s also good for rainy or snowy days when a lot of wetness gets tracked in, and you don’t want it to cause a bigger mess. It’s also nice to have around for freak accidents like when the washing machine or bathtub overflows. There are tons of times when a good mop is nice to have on hand. The Spin Mop has earned our nod of approval and we’re giving it our Solid Buy rating. It’s good to have around, especially if you have a lot of hard flooring surfaces that tend to need to get mopped frequently. This is nice for homes with small children where it’s imperative that floors stay clean while crawling and learning to walk, as well as homes with pets. It’s also good for homes that get a lot of foot traffic and always seem to be in need of a good mopping. There are tons of ways to mop up your floors. The Spin Mop does a good idea of putting a spin on the classic way of mopping. You can also try using a steam mop or a scrubbing mop that is designed to scrub your floors so you don’t have to use any elbow grease to get caked on messes up. What do you think? Does Spin Mop work or not? Does the Schticky Really Work? You generally can’t have everything you want, and this Spin Mop is no exception. I absolutely love the idea of no longer struggling with the wringing of the mop. It is definitely the hardest and messiest part of mopping my floors. However, I found the actual mop head to be a little on the small side, making it’s lasting power shorter. You can’t mop much square footage if it has a small head but if you’re willing to substitute that for having the wringing feature included, then this mop shouldn’t be a problem. I found the price to be a little steep but that can always be relative to the shopper. I didn’t pay forty dollars for mine and I actually got a rolly polly that that the bucket sits on. I think it works great. It gets beside and behind the toilet which is great. Also I have a cat and even after vacuuming or sweeping there is always cat hair and this picks it up. The Spin Mop makes life so much easier for this disabled person.